We are offer for sale. Hard Rock Cafe Amsterdam - 2012 Dutch Tiles Series Guitar Pin compleet set of 6 pieces. With Dutch post TNT on regulair basis. Bayers from European country, s please note. 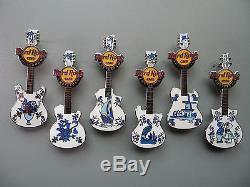 The item "Hard Rock Cafe Amsterdam 2012 Dutch Delft Tiles Guitar Compleet 6 pc Pin Set" is in sale since Wednesday, November 1, 2017.